This chestnut spread did not turn out as expected. In fact, I thought it was going to be a creamy vanilla white colour with a smooth peanut butter like texture but instead it is a crunchy, crumbly, sugary spread that is more like a nut topping than a spreadable jam. At first, I thought it was a complete failure but Matt assures me “all is not lost…it has great flavour and will add something special to coffee cake.” Phew…I feel much better! The chunky texture may have something to do with the freshness of the chestnuts or this may just be the nature of the nut. But, like so many recipes with few components, the success or failure comes down to selecting the freshest ingredients and putting them up as soon as you get them. I suspect these chestnuts sat around the store for a month longer than they should have. Even as I was shelling them I found several that were spoiled. This recipe comes from Christine Ferber’s book Mes Confitures and I modified it slightly to add a little citrus and some hootch (rum), two flavours that compliment the natural sweetness of chestnuts. Make a deep cut in each chestnut (from the top to the bottom) with the point of a knife to cut through its two skins. 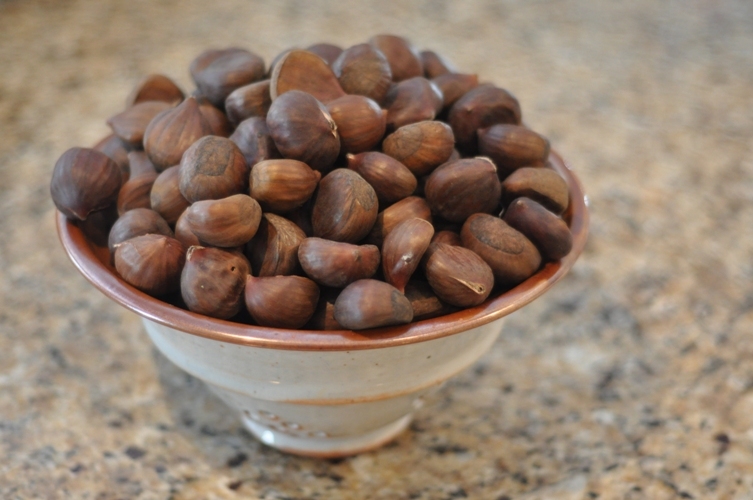 Put chestnuts in boiling water. After 3 minutes, you will be able to remove the outer shell and the inner skin. The chestnuts are relatively easy to peel if they are hot but once they cool off the inner skin becomes very difficult to remove. Do this step in stages or with a friend only boiling a handful of chestnuts at a time so that you can quickly remove the two skins before they cool down. 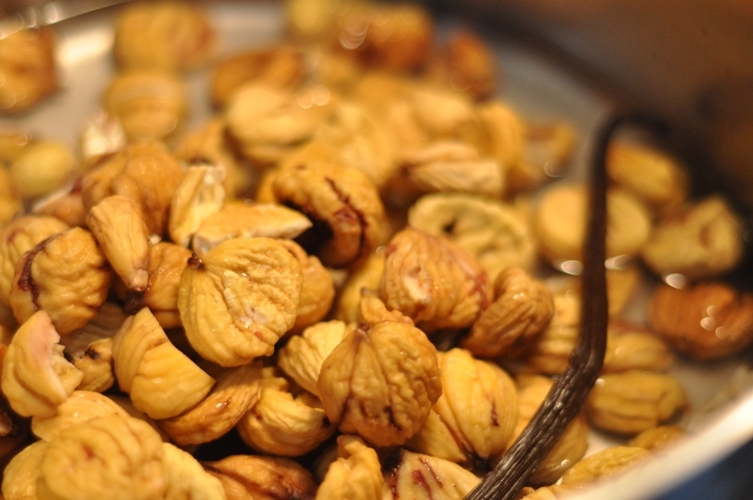 ﻿In a preserving pan, combine the chestnuts, sugar, water, and vanilla bean, split lengthwise. 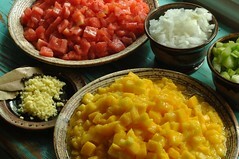 Bring to a boil and then reduce heat to cook for about 15 minutes, stirring gently. The chestnuts will be soft. Pour the mixture into a ceramic bowl. Cover with a sheet of parchment paper and refrigerate overnight. Next day, bring this preparation to a boil, stirring constantly. Note: My mixture was rock solid, the sugar had crystalized, and the chestnuts were very hard (it may have been overcooked the day before or my fridge too cold). Skim if need be. Crush the large pieces of chestnut with a wooden spoon. 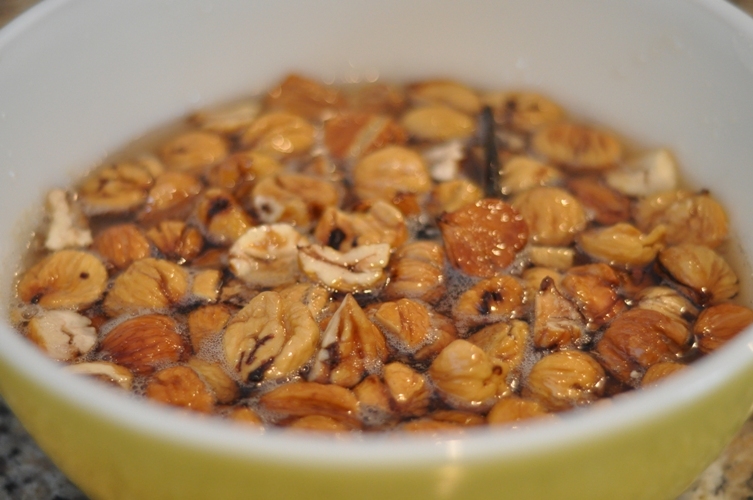 Remove the vanilla bean while crushing or blending the nuts. Again, the chestnuts were too hard (even after heating) to crush with a spoon. The mixture was transferred into the cuisinart to break into fine pieces. 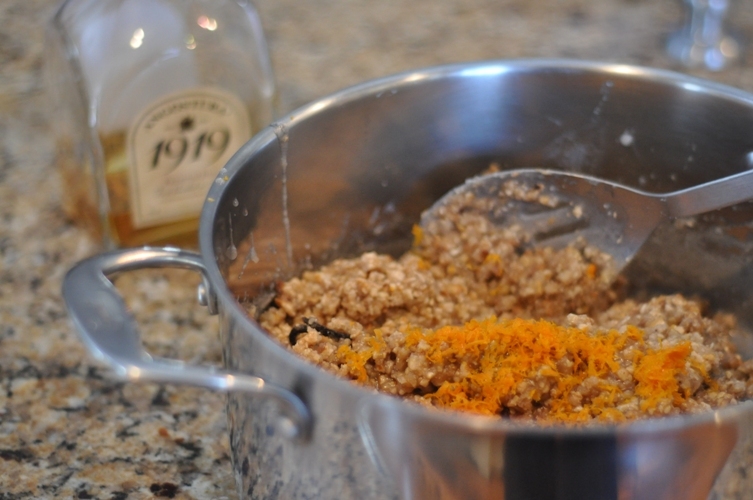 Add the orange zest and rum to the mixture. Combining well. Continue cooking on low heat for about 10 minutes, stirring continuously. Cooking for 10 minutes was unnecessary as my mixture was already thick and well set (for this reason, I believe it was overcooked the day before). I reheated it so that it would be hot when it was ladled into the sterilized jars. Remove the vanilla bean and cut a piece to go into each jar. Ladle hot spread into hot sterilized jars leaving 1/4″ headspace, wipe rims, place lid and ring to finger tip tight on each jar and process in hot water bath for 10 minutes. Turn off heat, remove lid and let stand for 5 minutes before removing jars. Check seal, label, and store. This is not a recipe I will be attempting to perfect now or any time in the future. 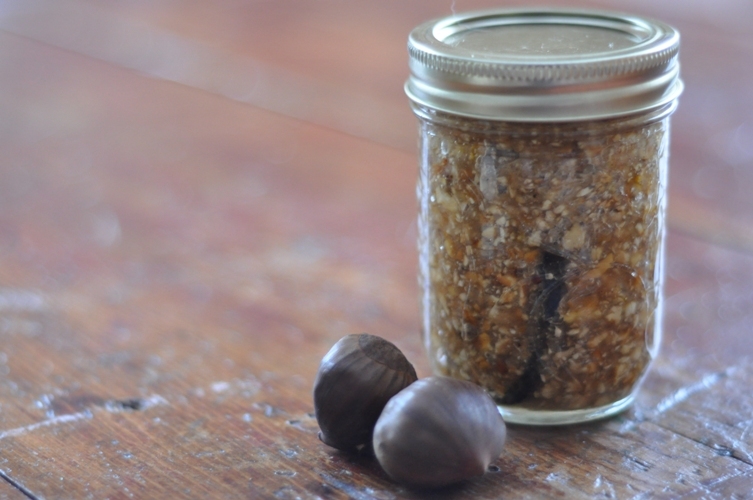 Chestnuts are relatively expensive and the initial preparation of this spread is time-consuming and difficult. Initially, I was curious about creating this jam/spread as it was unusual and used ingredients that we can only get at this time of year. For now, I’ve satisfied my curiosity. This experiment may be worth repeating if, and only if, you have a glut of nuts that you can get for free and can spend an afternoon doing the tedious job of shelling them with a friend. Side Note: this is more for my records than anything else…Jarred the 4th Batch of Fermented Sauerkraut (19lbs). And again I am so amazed by what you can! I’ve never heard of chestnut spread before but this sounds incredible! Wow!! By the local river – there are a LOT of chestnuts just dropped on the ground. I’ve never known how to tell if they were ‘ripe’ or safe to eat or how to prepare them. I just know there’s the song with ‘chestnuts roasting over an open fire’. Since you DO forage – can you tell me anything about foraging chestnuts? This sounds wonderful. And since you said it is a bit too granulated to work as a spread, why not add it to stuffing if you roast a duck, guinea fowl or pheasant. Chestnut and Orange always works well with those birds. Great idea…thanks!! Not all is lost ~ it will get used (we may just have to be a little more creative). I was a little underwhelmed working with Italian chestnuts as well. I made Marroni al Liquore and my chestnuts came out hard and mealy. Not sure if I roasted them too long? Either way, they’ll be delicious in something. I feel your pain of a much anticipated recipe that has a pretty hard let down. Thanks…It is frustrating when things don’t turn out the way you expect. I think my problem was over cooking them…but Wild and Weedy Girl had a lot of good tips too! On a completely separate note, I was thinking of you guys this morning and just imagining that great big shelving unit you have. Do you sell your preserves? I imagine you’re everyone’s favourite gift-giver, but how do you begin to use up all those preserves? The amount of canned goods we have does seem gluteness…by October/November our pantry shelves are well stocked (and it is just the two of us). But, we frequently have friends dropping by and I’ve become kinda like a “mama” always wiping something from a jar out of the fridge or pantry. We gift lots and are just starting to think about selling a few things. However, other than the 50+ varieties of jams, jellies, and marmalades we get through most everything within the year. In fact, we put up 10 bushels or 500+ pounds of tomatoes, 5 bushels of apples (just for sauce) and made about 80+ litres of soup and we will run out! We hardly ever eat out and we do a fair amount of entertaining. Matt is even finding more creative ways to use up the jams…he will regularly make a sauce or glaze for chicken out of marmalade/jam and we always have some kind of pastry kicking around…he’s an excellent baker and cook (I think that helps). So, there is a revolving door on most things. Hey, that’s great! Nothing better than having food at the ready for a quick gift or an impromtu party. I also love having a stocked cold storage and I find having preserves really amplifies a very simple dish, so it’s perfect for entertaining on the fly. As soon as I’m done the 100 Mile Challenge, I’m excited to give more of your recipes a try. As for selling, would you sell online, farmers markets or both? Wow, I bet that would be delicious. My parents have a chestnut tree so I could potentially give it a try. But the shelling all day part – I’m not sure I could handle that! I think there might be something wrong with the recipe…? Chestnust spread is an old favourite for breakfast: it’s supposed to be brown (dark caramelly tones) and smooth. The peeled chestnuts are boiled in plain water until soft, before they are candied, then blended smooth, and cooked some more to dry it out. At least, that’s how I remember all the recipes I’ve ever read. Some even call for canned or frozen cooked chestnuts. I really love your thought process when you came up with this bar and the pairing of chestnuts and cranberries. This site is a way for me to share my love of food and interact with all you Femme Fatales out there putting food on the table for your loved ones everyday.